To understand the challenge, imagine a man, alone in his apartment, who loves classic Broadway musicals so much his home morphs into a stage, alive with music, dance and lot of humor, while he's swept into the production. Main Street Theatre & Dance Alliance asks RIVAA's artists to set the scenes for a pair of side-by-side, very different universes. "I love it so much," he muses. As antic musical comedy springs to life, filled wit memorable songs and dances, the Man in Chair adds running commentary and wry observations, adding context to a dreamlike setting. RIVAA's task is to create believable backdrops that complement the electric action. "They're transforming the walls of our little black box theatre into the one-room studio walk-up apartment of the lead character," says Lucid, a veteran of numerous productions here and elsewhere. "After their transformative work on the backdrops of last years' Seussical and Pippin, I can't wait to see what they will do with a less fantastical, more realistic setting." By the way, complimenting the eccentric Main in Chair is the drowsy chaperone herself. Drowsy actually means intoxicated. And then, there are the leads, vivacious actress Janet van de Graaff and her hopeful fiancee Robert Martin compliment a host of whacky players. The fun is pretty much nonstop. MST&DA Executive Director Kristi Towey is excited about this second year of working with RIVAA. “We're so excited to have RIVAA on our production team again this year for The Drowsy Chaperone. Their professionalism, passion for the arts, vision for the production, and talent is obvious in their work. Last year they created amazing sets for three of our productions - Almost, Maine, Seussical Jr, and Pippin," she says. "If you missed their work last Spring, don’t miss it this time!" 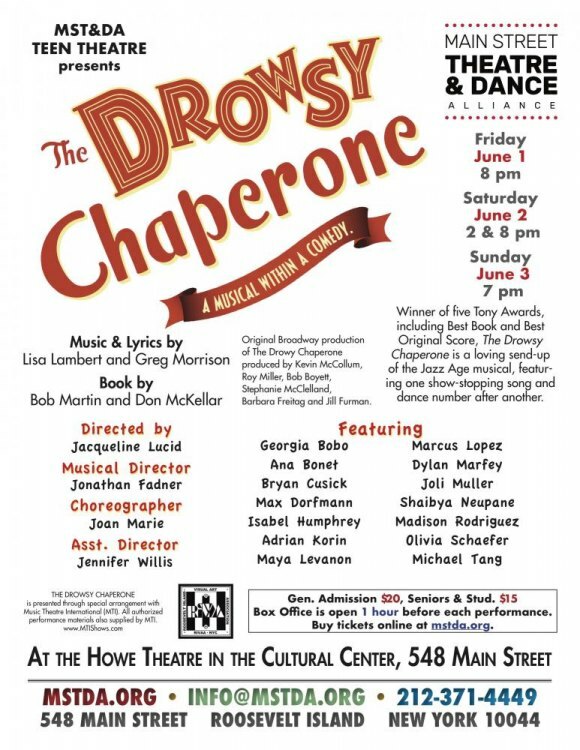 The Drowsy Chaperone opens Friday, June 1st, in the Howe Theatre in the Cultural Center, 548 Main Street. Learn more and reserve your seats for any of four weekend performances by clicking here.